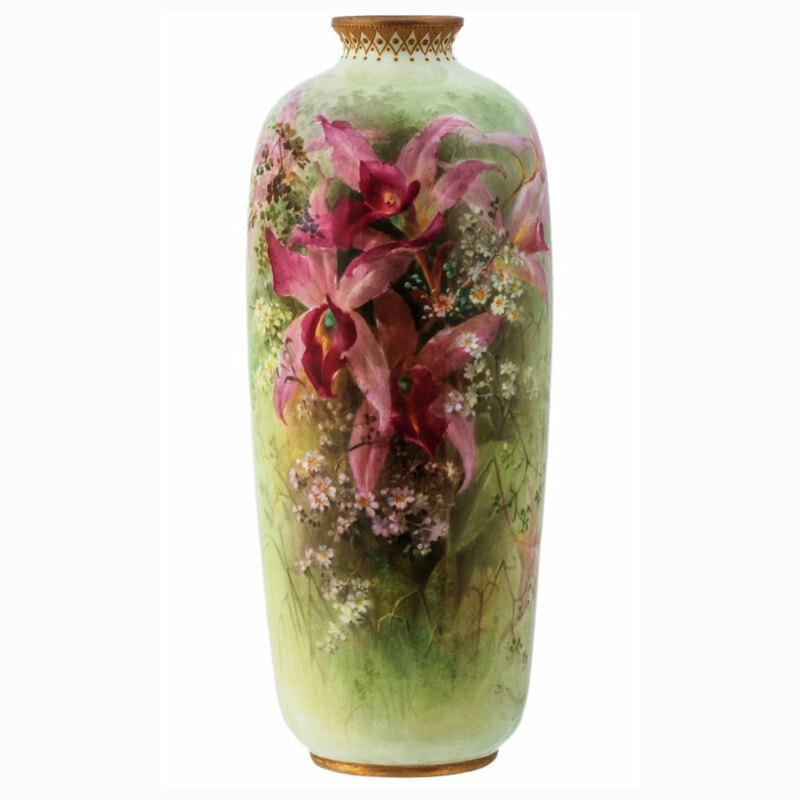 Since ancient times, orchids have been valued for their beauty and beneficial effects. 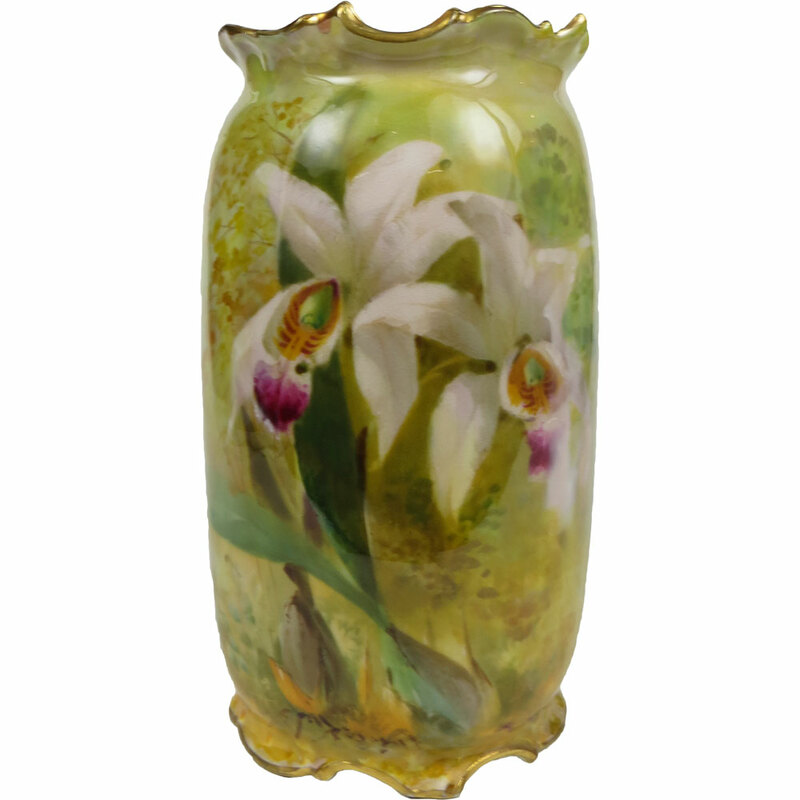 The Greeks and Romans cultivated orchids for medicinal purposes, including varieties for aphrodisiacs. 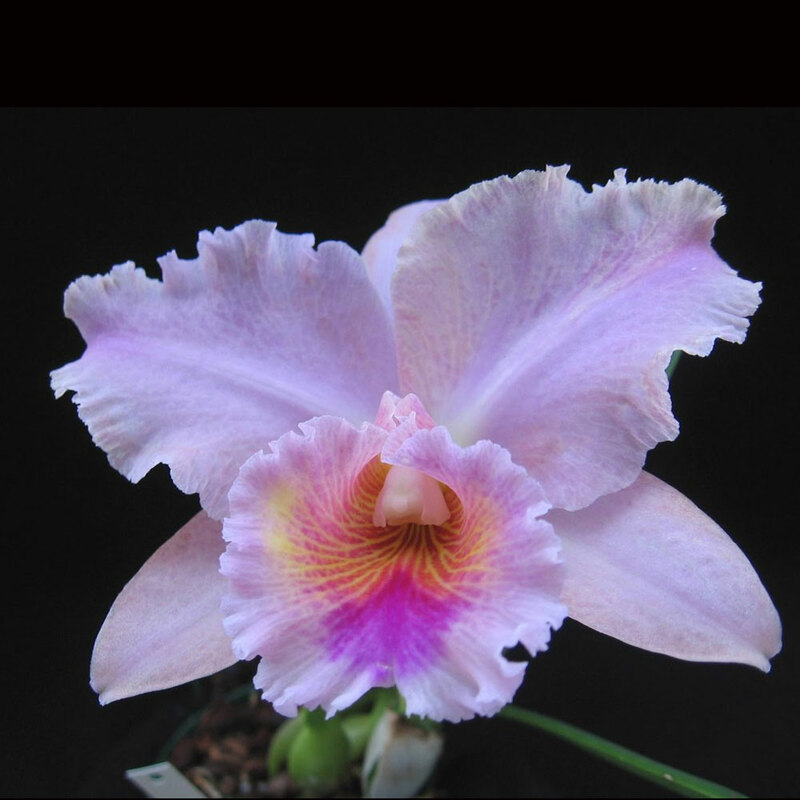 In South America, orchids were grown for their perfume and culinary uses. 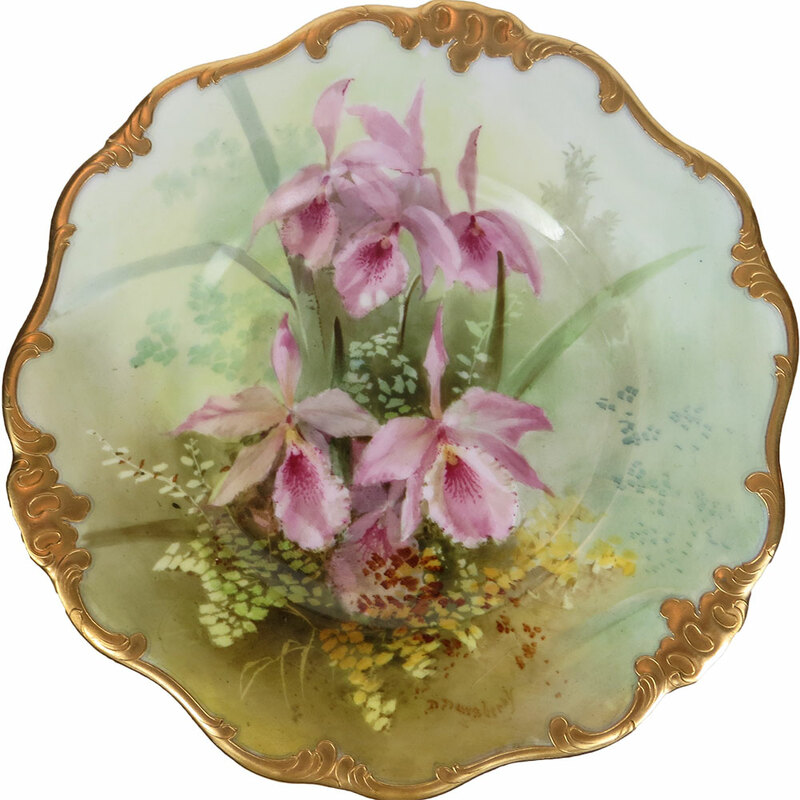 However, orchid mania really took root in 19th century Britain where vast quantities of tropical species were cultivated for wealthy collectors. Orchid hunters plucked thousands of new species from the rainforests of the world and shipped them to specialist nurseries for classification by botanists. 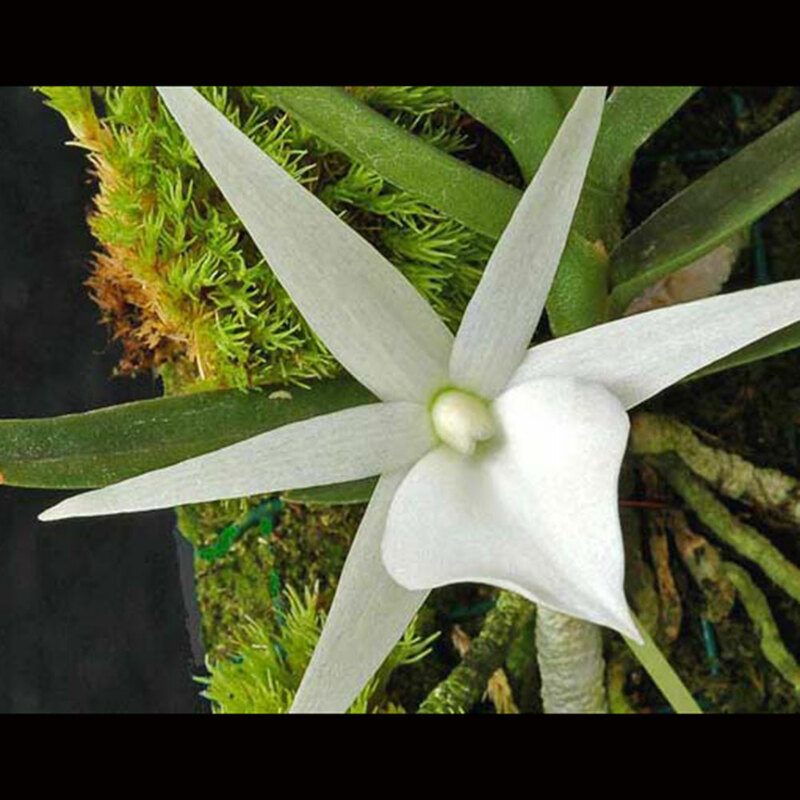 Huge sums of money were paid at auction by European collectors for the latest orchid sensation. 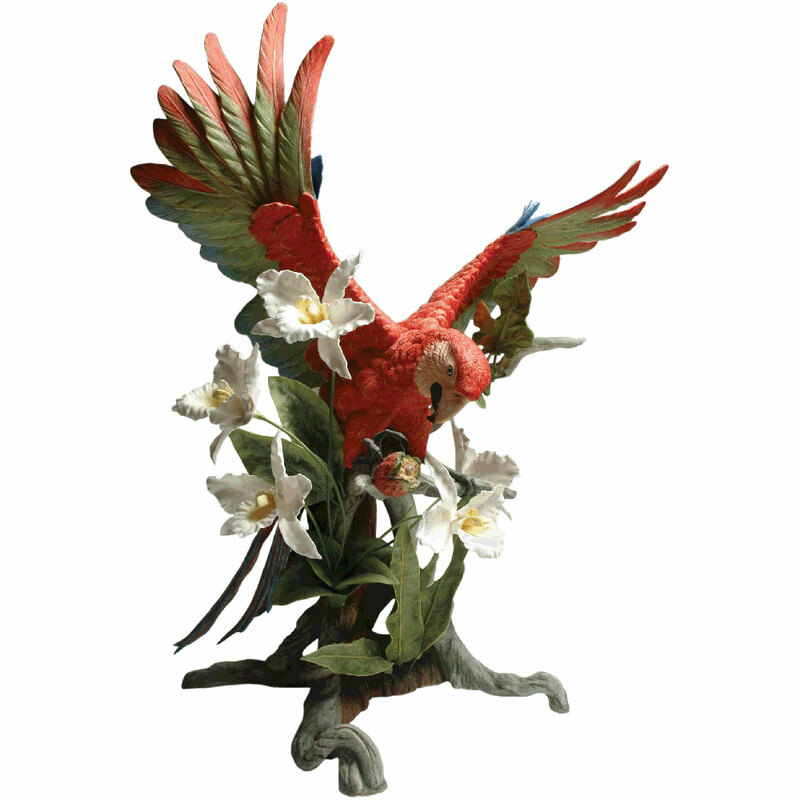 By the turn of the 20th century, the lust for tropical orchids had spread to the East coast of the United States and keen collectors displayed their treasures in giant conservatories on both sides of the Atlantic. The sixth Duke of Devonshire was an early orchid collector and a pioneer of conservatory design at his Chatsworth estate in Derbyshire. His gardener, Joseph Paxton, later constructed the Crystal Palace for the Great Exhibition of 1851 and was knighted for his services to horticulture. A spectacular orchid conservatory was built also at Trentham Hall, the Staffordshire seat of the Duke of Sutherland, acknowledging his status as the wealthiest landowner in Britain at that time. 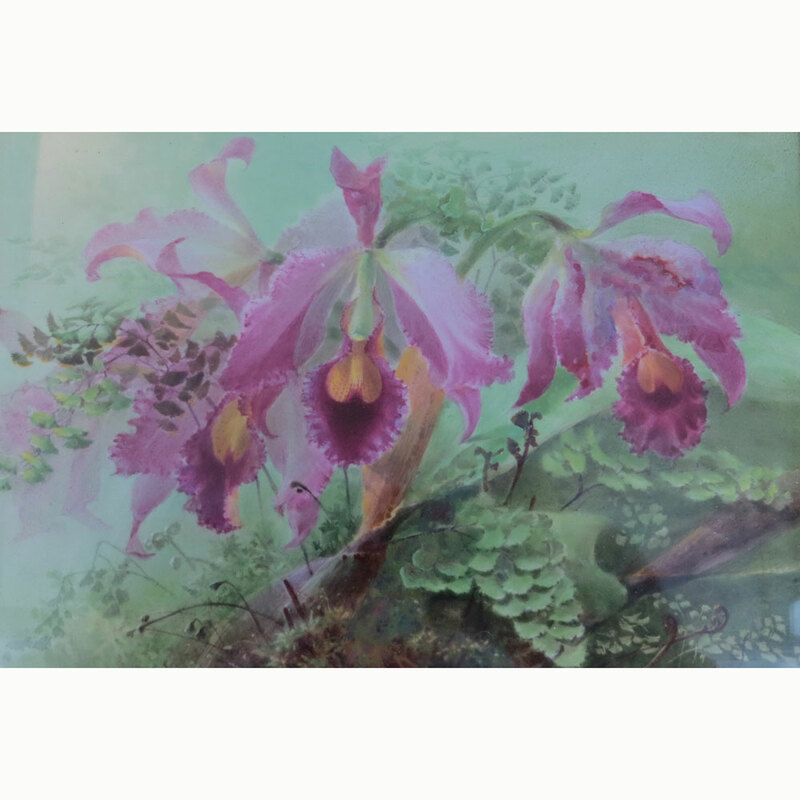 Also in Staffordshire, James Bateman amassed a huge collection of orchids at his garden in Biddulph Grange and published notable books on the subject. 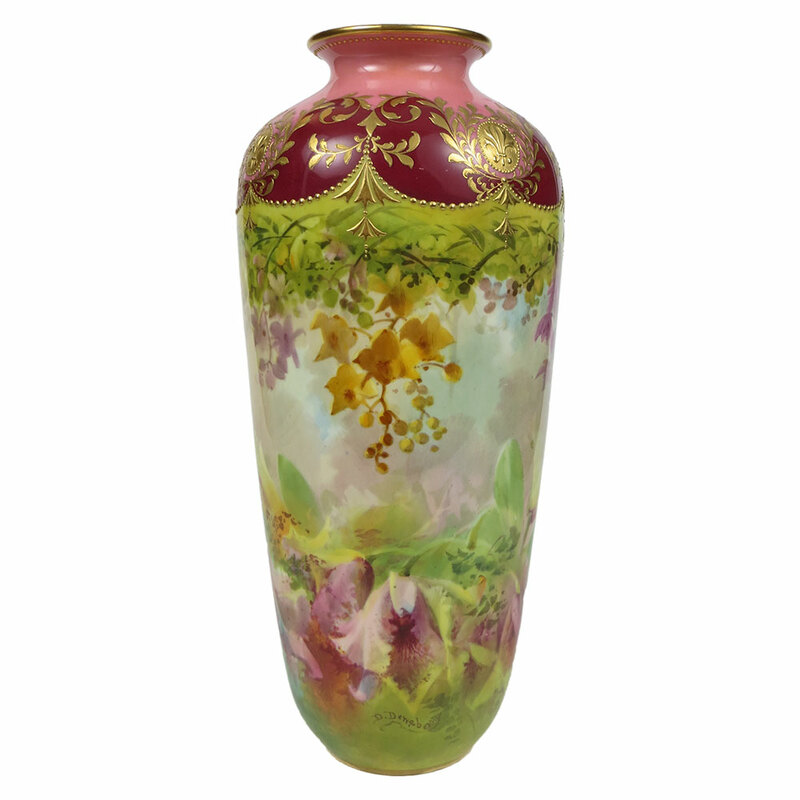 With all this inspiration near the Staffordshire potteries, it is not surprising that the Royal Doulton factory catered for orchid enthusiasts with beautiful hand-painted designs on bone china vases and dessert services. 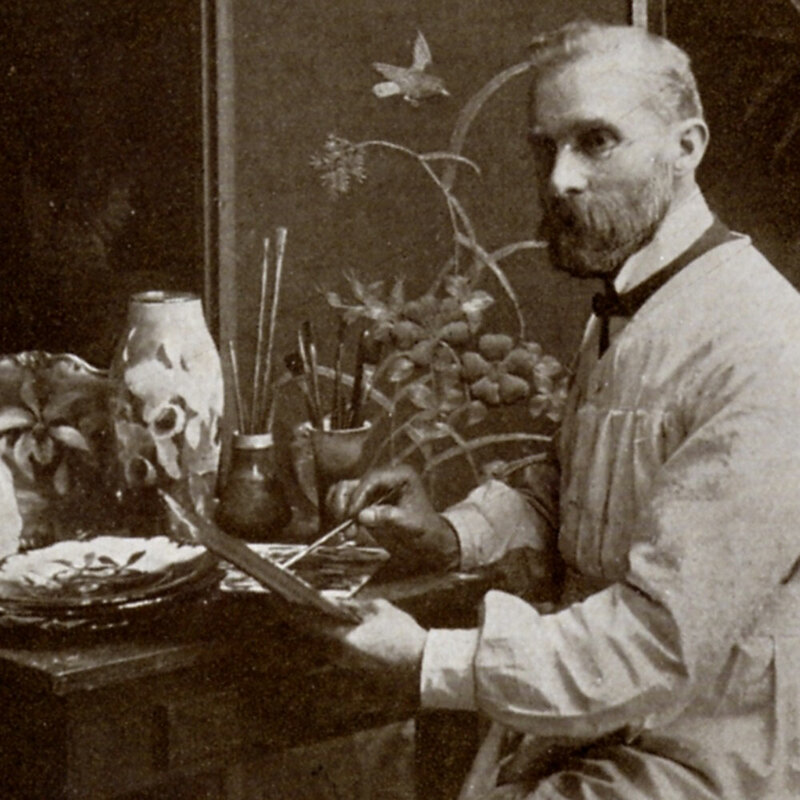 David Dewsberry, Doulton’s specialist orchid painter, joined the Burslem studio in 1889 and spent the next thirty years studying all the different varieties in the local conservatories. 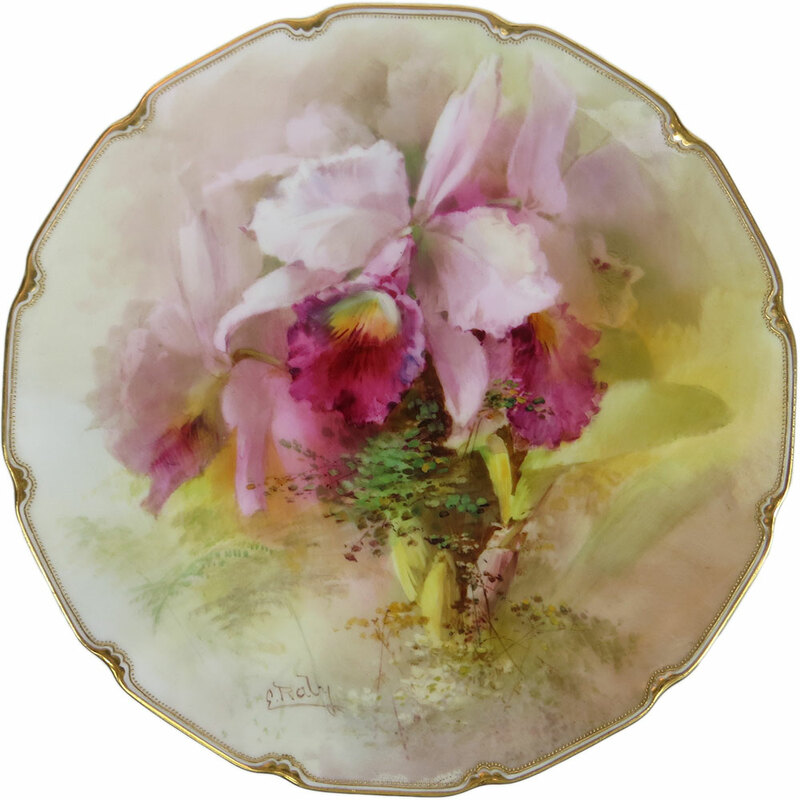 Dewsberry’s fidelity and subtlety of tints, together with his masterly compositions, made him the finest orchid painter ever known in the ceramic industry. 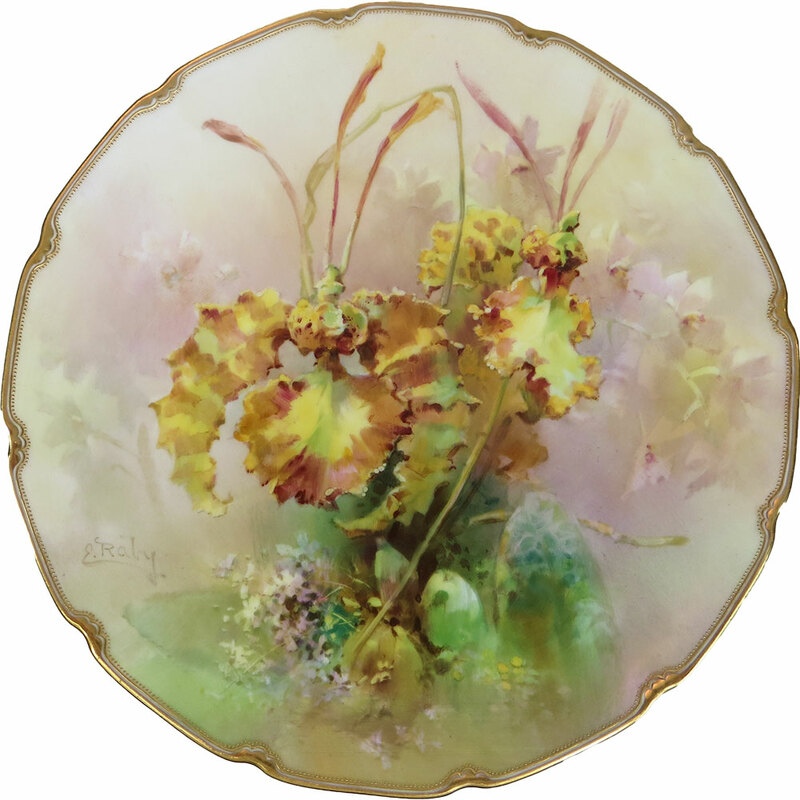 Surviving watercolours testify to his powers of observation and artistry. 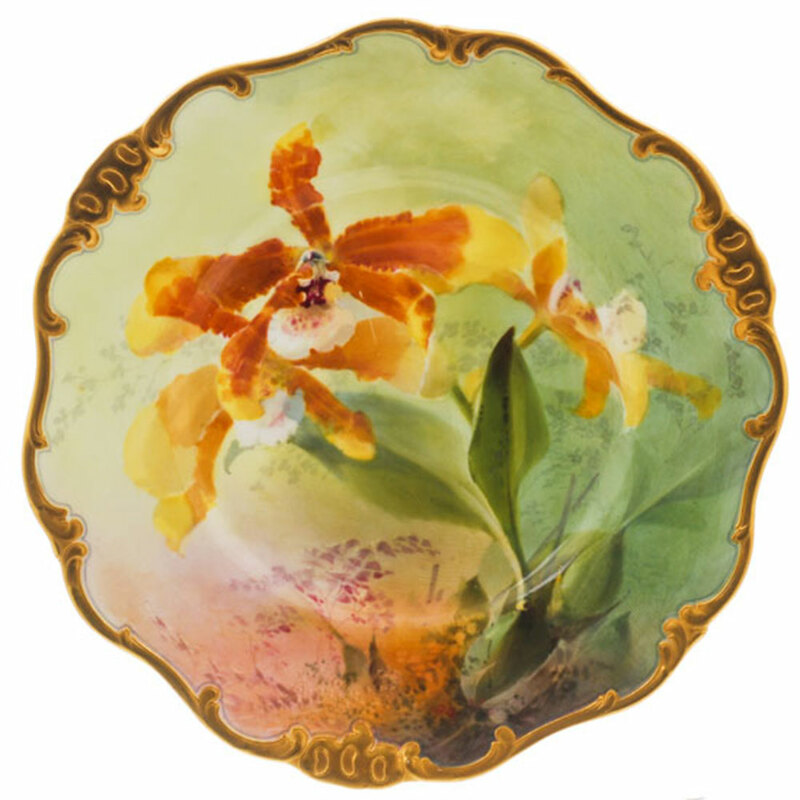 His exquisite hand-painted orchid designs on dessert services were often framed with 22 carat gold embellishments and they were sold through luxury stores such as Tiffany’s of New York. 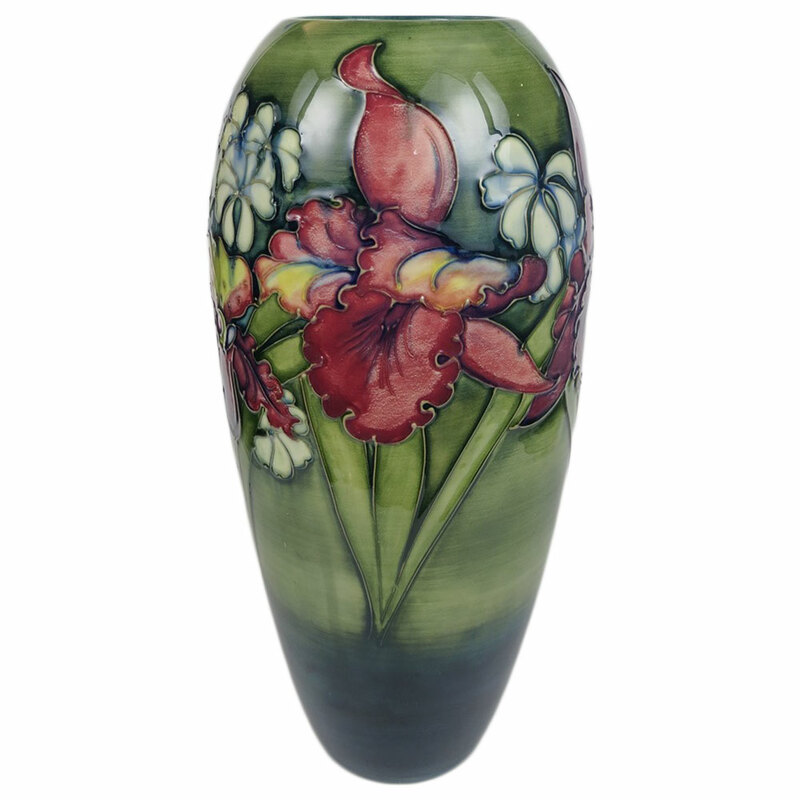 William Moorcroft created some stunning orchid designs, decorated in his distinctive tube-lining technique, and these were made at his Cobridge pottery during the early 1900s. 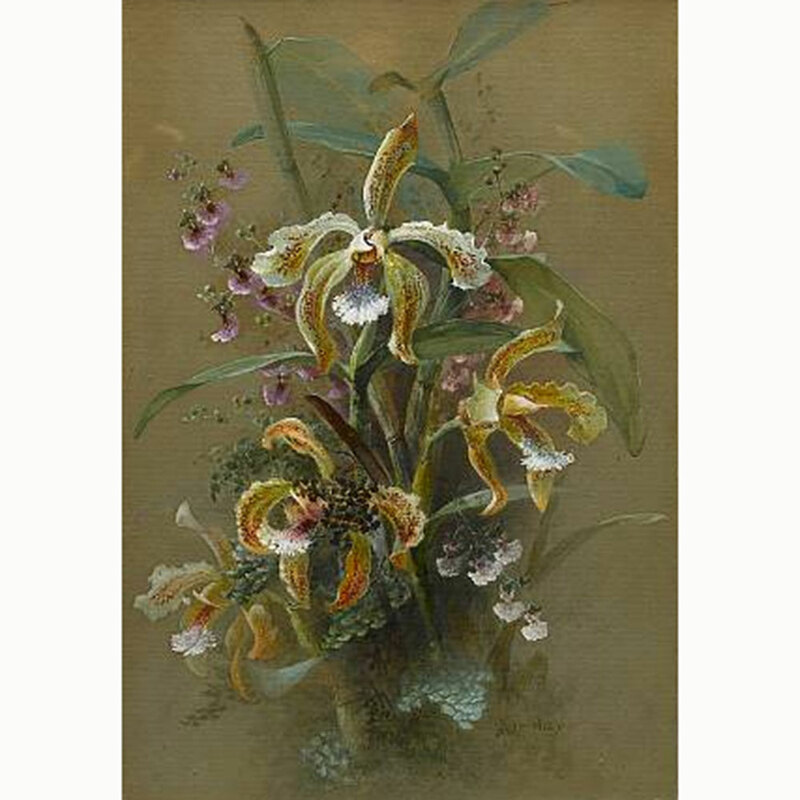 No doubt William was influenced by his father, Thomas, who loved orchids and won a national art competition in 1875 with a painting of white orchids in Trentham Gardens. 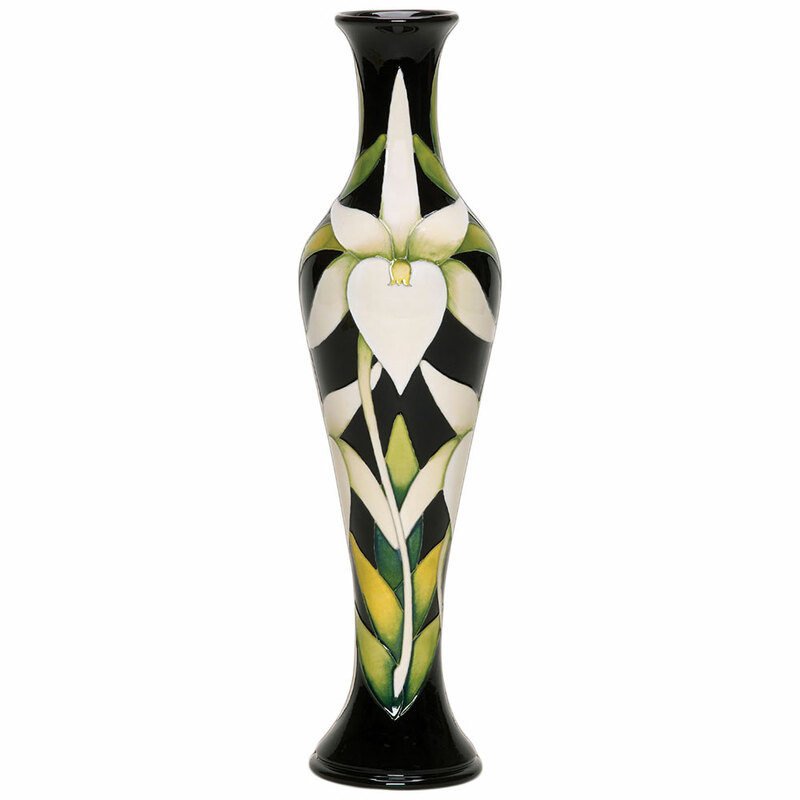 The Moorcroft pottery became famous for the slipper orchid pattern designed originally by William and continued by his son, Walter, in the 1940s and 50s. 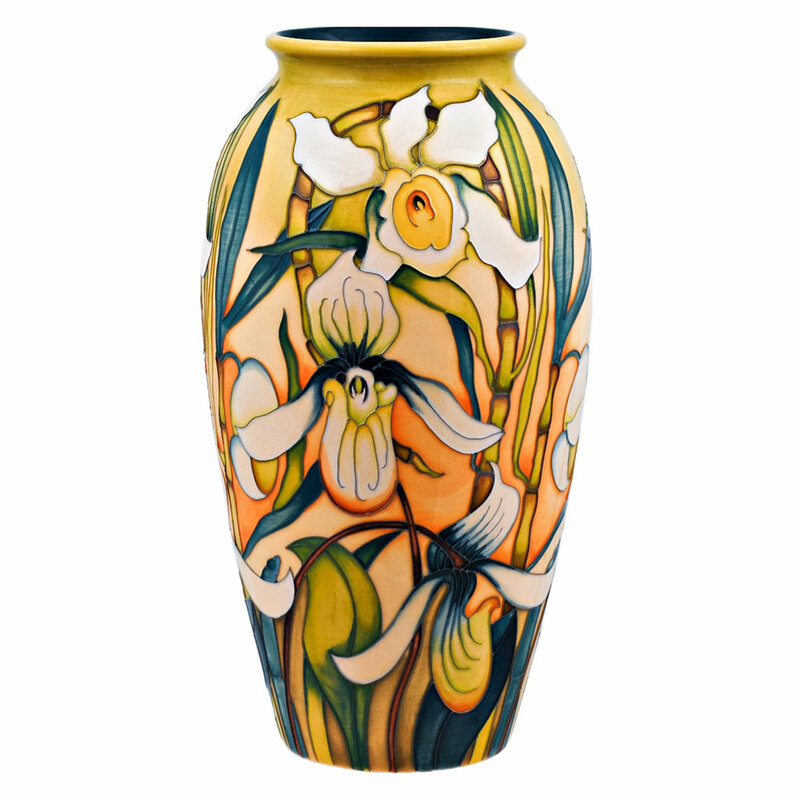 Over the years, this popular orchid design was produced in a variety of colours against backgrounds of blue, green, ochre and cream. 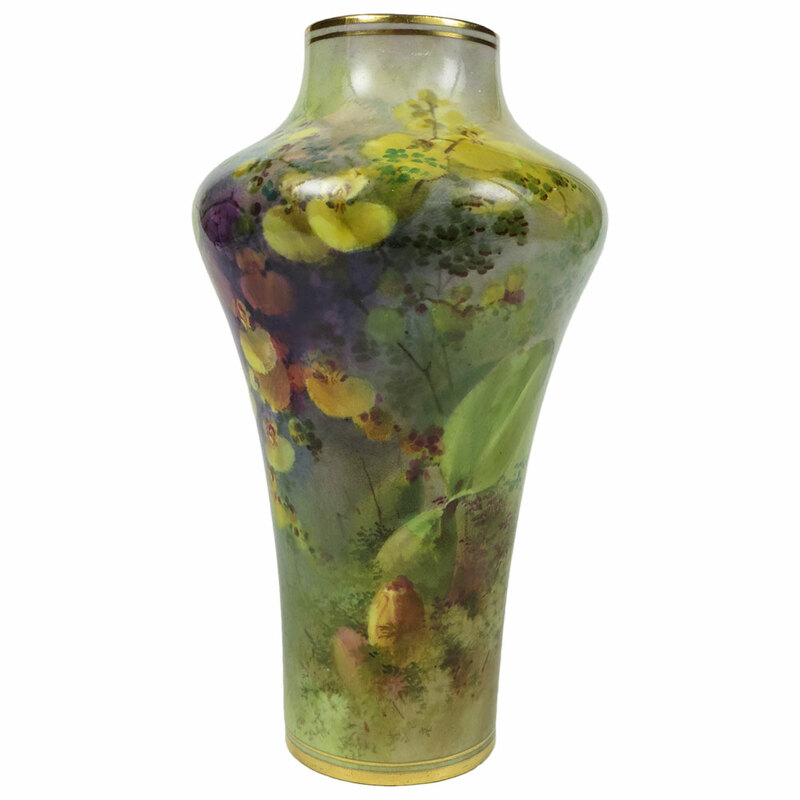 It also looks very dramatic decorated in flambé glazes. 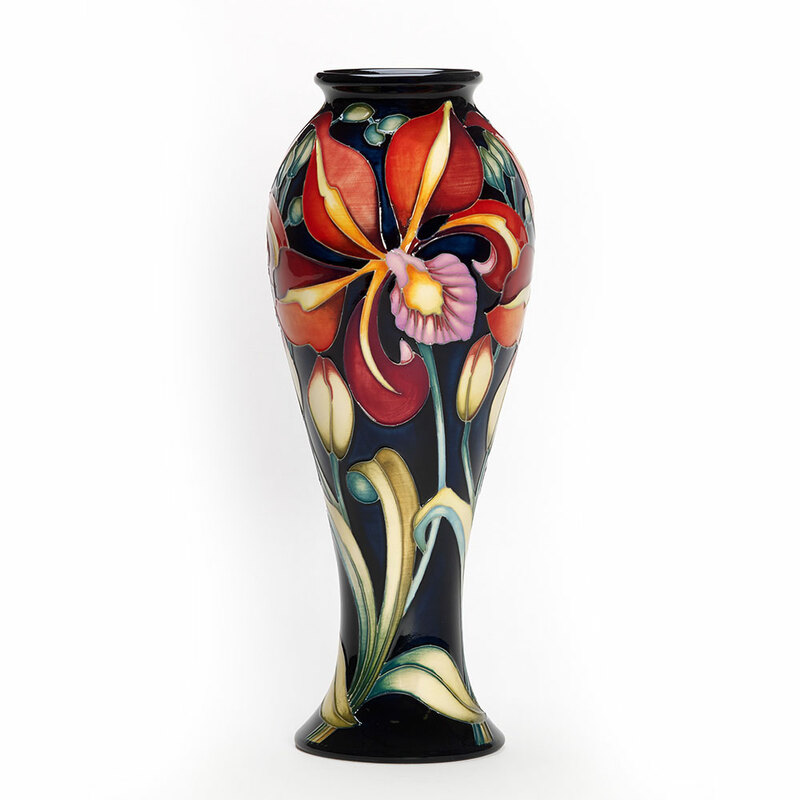 The modern Moorcroft designers created several new orchid vases for their Legacy collection celebrating the factory’s centenary year. 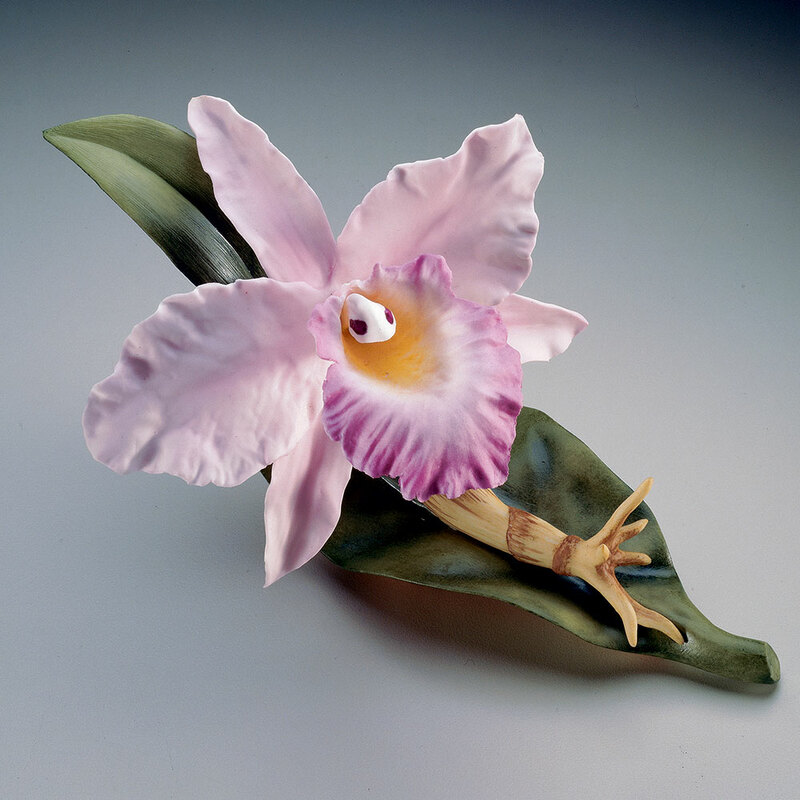 Exquisite porcelain orchids were fashioned petal by petal by Edward Marshall Boehm in Trenton, New Jersey. 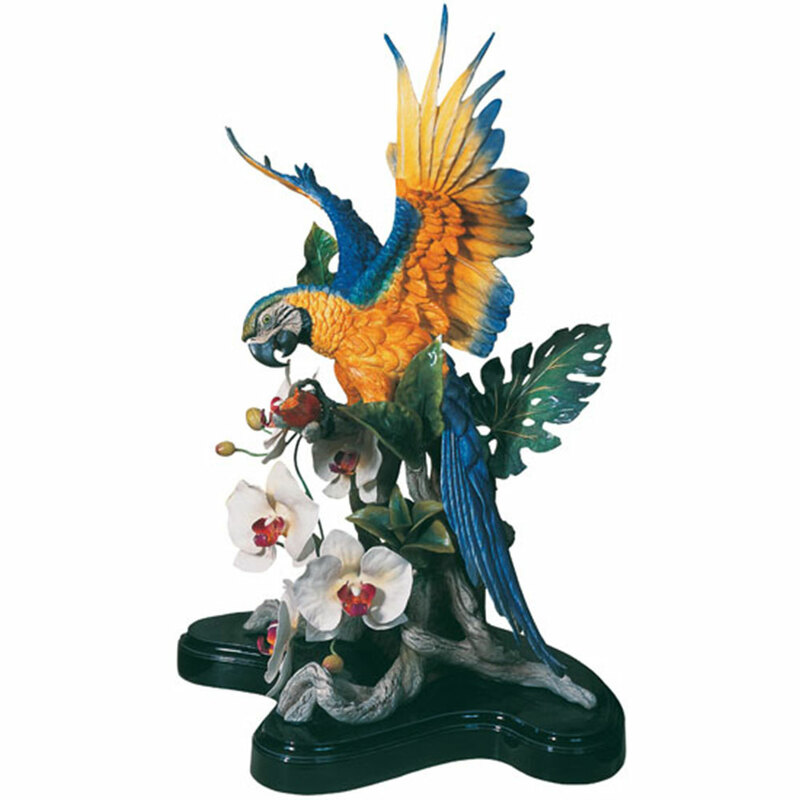 He studied flowers in the beautiful garden he created on the Delaware River and his carefully observed orchid sculptures often include birds, in particular macaws and humming birds taking the nectar. Boehm’s porcelain body was produced by using organic algae to bind the clay which enabled detailed sculpting. 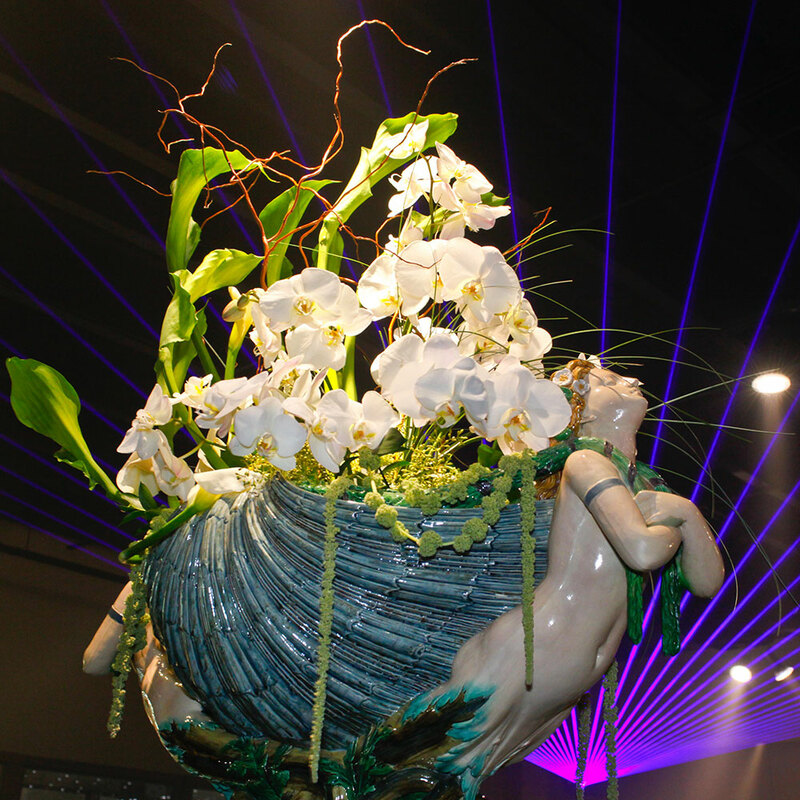 The resulting petals and leaves were very flexible allowing them to be arranged in the most naturalistic way. 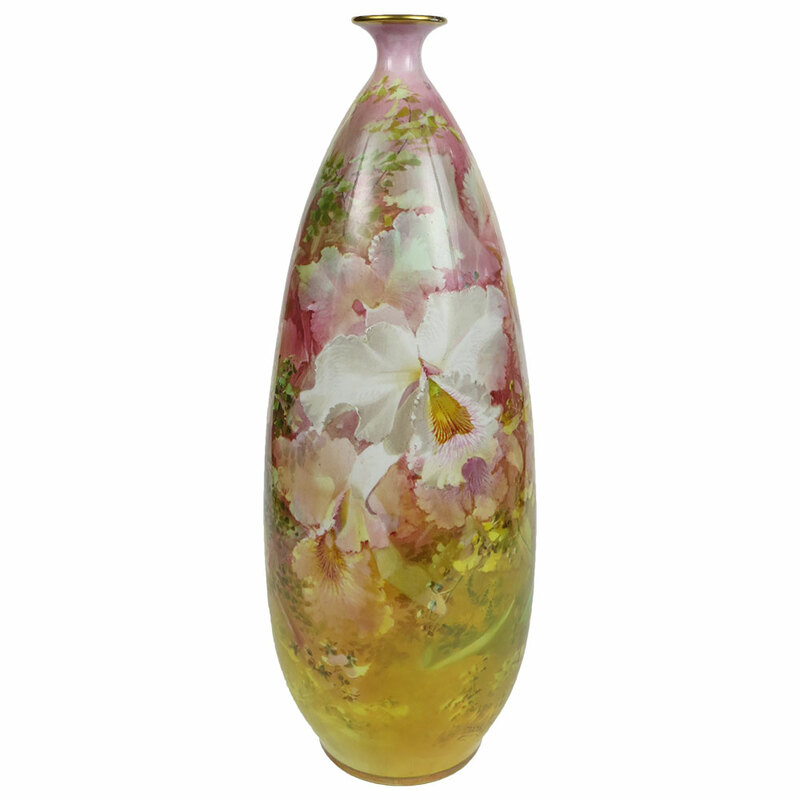 The algae was burned away during the firing process leaving a thin, translucent and luminous finish. 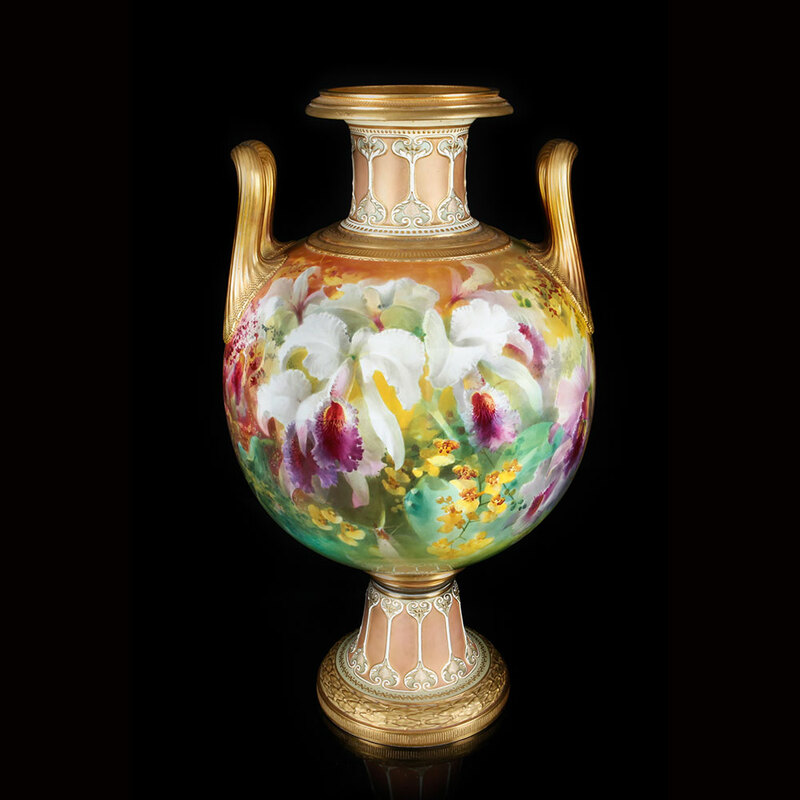 Boehm’s work is regarded as the finest American art sculpture, displayed in museums around the world and collected by presidents and princes. 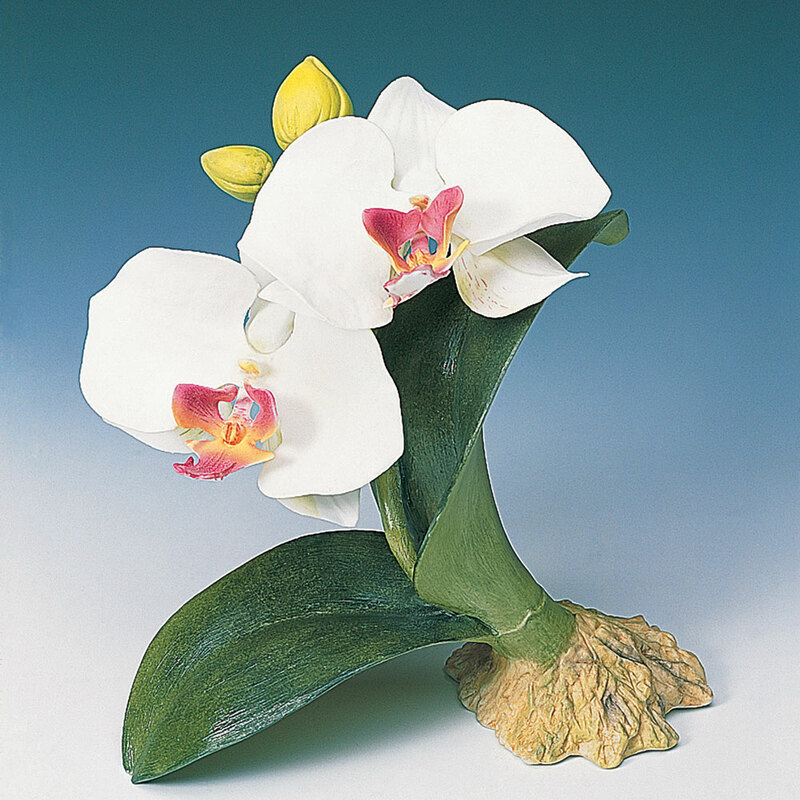 Orchid lovers can delight in these highly realistic porcelain sculptures whose beauty never fades. 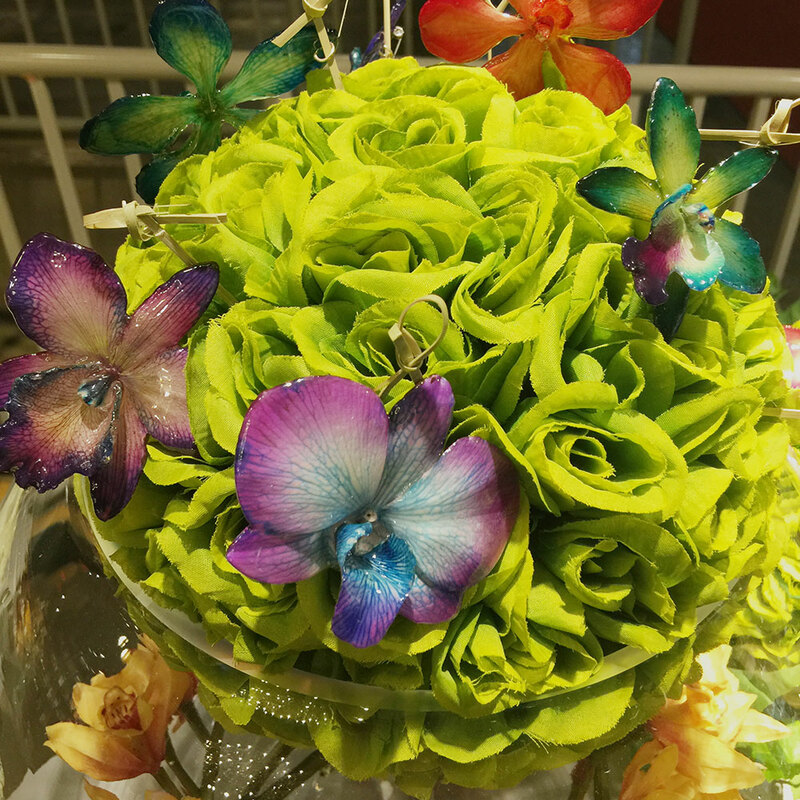 The new orchid jewelry at our museum shop which is made from real flowers, designed by nature and preserved forever using a unique process. 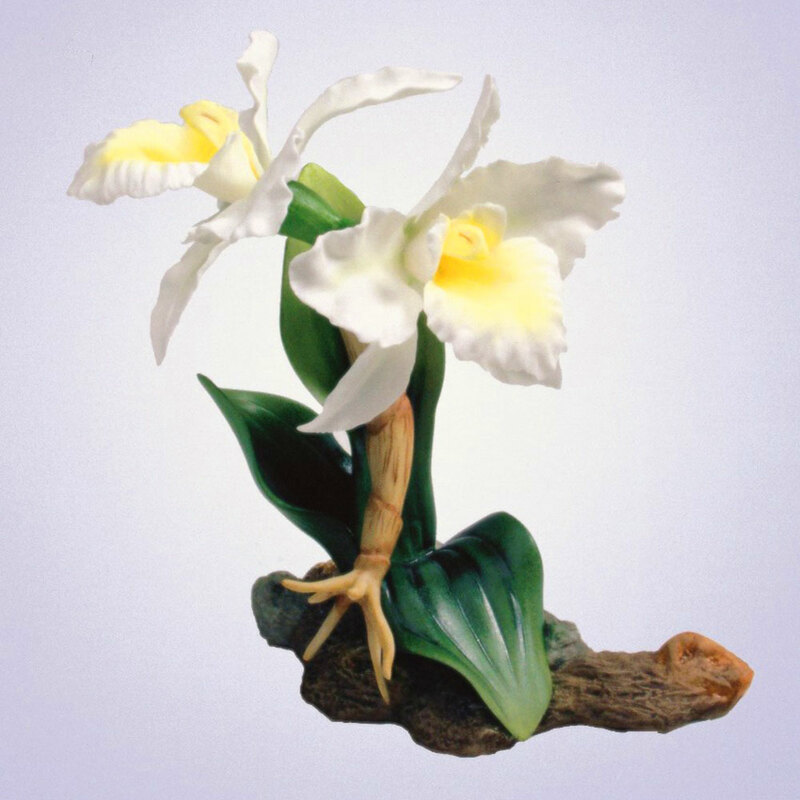 The instant popularity of the orchid pins, pendants and earrings with our visitors prompted us to look at how orchid mania has inspired ceramic artists from the Victorian era to the present day. Florida fans can also enjoy the 16th Annual Orchid Festival at Fairchild Gardens from March 9-11.